A boxing certificate is much needed when you are about to recognize the success or achievement of a boxer. No boxing tournament is complete without the handover of the boxing certificate to the fighter. The free certificate states clearly the position attained by the fighter and can be used as a proof of the fighter’s participation in the championship. Do you too need to design a boxing certificate and looking for ideas? Well, the pre-designed boxing certificate templates would be a handy help here. 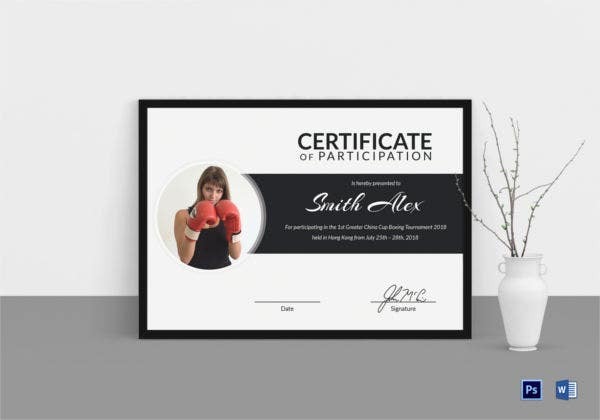 You have a minimalist yet smart boxing certificate template here in beige background- while the hint of muted red here and there lends the needed color to the whole thing. This has to be the perfect boxing certificate template with the watermark of a boxing ring. The black aura all around brings gravity to the overall thing. The red border looks classy for the certificate content. You have a classy boxing achievement template here in black & white – the framed backdrop adds further elegance to it. You can even add the picture of the achiever here. 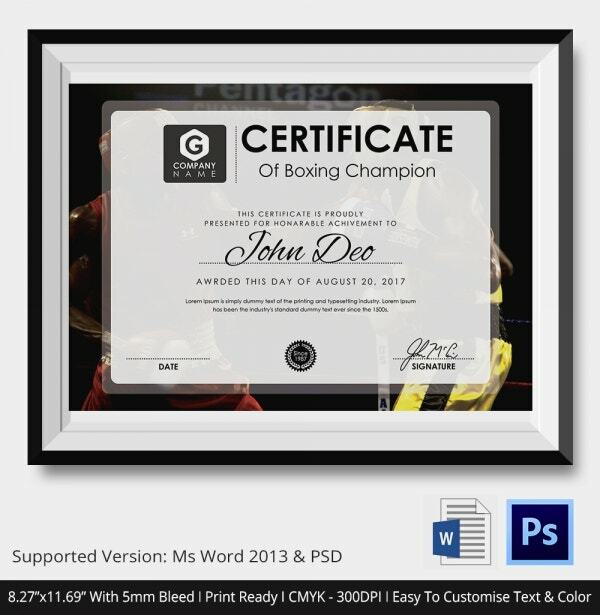 With 2 mighty boxers fighting at the back, this template assures the best certificate sample for an ideal boxing certificate. The certificate follows a neat professional layout throughout, starting with the name of your organization at the top. If you are looking for some unique vintage look for your boxing certificate, this retro template would be great- you surely can’t miss out on the sneak peek of the old-world fighter poster at the background. > Who Needs Boxing Certificate Template? 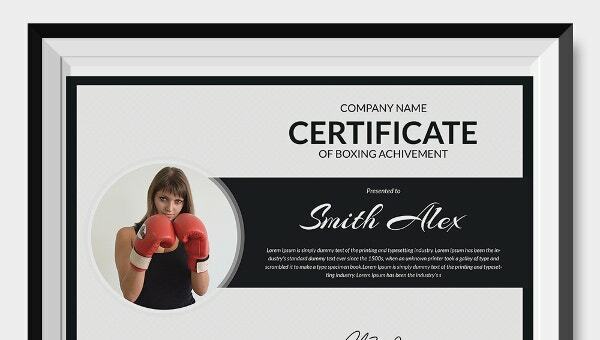 A boxing certificate template is a must-have when you are running a boxing course institute. If you have aspiring boxers training in your organization then you would have to acknowledge their achievement at the end of the training term with boxing certificate template. Besides, the organizations that run boxing championships would also need these boxing certificate templates while awarding the champion boxers- at the end of the tournament. However, this is to mention here that some of the minimalist boxing certificate templates can be used for office certificates as well. 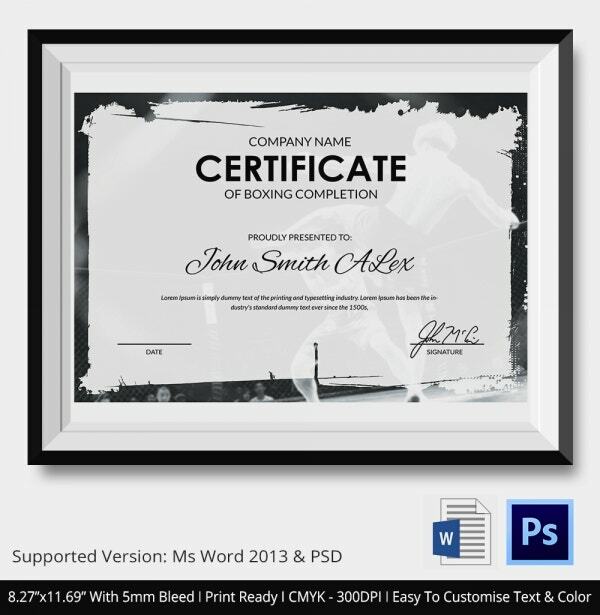 The templates make your work easier by offering ready-made certificates. > What is the Purpose of Boxing Certificate Template? The main purpose of boxing certificate template is to acknowledge the great achievement of a boxer- whether he is fighting in a championship or has completed a boxing training course. A certificate is the official document that serves as an evidence of the feat of the boxer and hence is always something vital for a boxer. 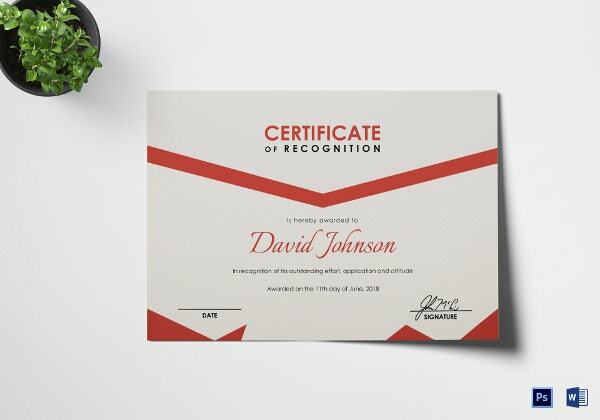 On one hand, the certificate recognizes the merit of the fighter- on another hand, the certificate works to instill a sense of confidence in his mind with the notion that his achievements are worth to be acknowledged and documented. The boxing certificate templates are always a great time-saver as they save you from designing the whole thing from start. You may also see Volley ball Certificate Templates. 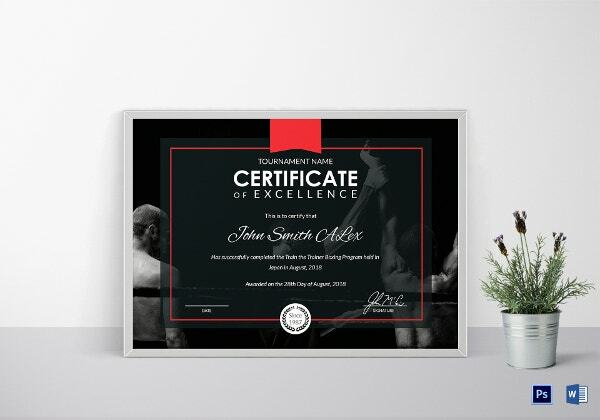 The above mentioned boxing certificate template would be really helpful when you are looking for standard expert designed boxing certificate samples. You have them in a wide range of themes, ranging from classy to vintage to minimalist – and there are even some of them that are aptly designed with pictures of a boxing ring and boxers at the backdrop.